Guild size of 300 is currently the maximum cap that can be attained by leveling the guild and selecting the path of size as opposed to the path of guild skills. Q: What’s the minimum guild size to really have a meaningful impact on the realm? There are mechanics that are geared towards larger and smaller guilds. Larger guilds can siege fortresses. Larger guilds won’t have access to power boosting guild ability slots. Small groups can do some things better than larger groups. Sieges will have things that smaller groups have an advantage in. There are prerequisites for guild formation. Minimum member count of around five individuals. Players may be able to form guilds in starting areas if minimum requirements are met. A character may only be a member of a single guild. Alts on the same account can join different guilds. Intrigue, espionage and intelligence gathering is a legitimate aspect of the game. A guild may only have a single guild leader. Transfer of guild leadership is possible, but mechanics on transferring leadership if a guild leader has abandoned the guild have not been finalized. Name of guild displayed next to character name. The term "guild housing" refers to guild buildings and not guild owned player housing. Summer guildhall appearance cosmetic concept art. Guild halls serve as a focal point for a guild, offering a host of benefits and customization options. A guild hall only houses a single guild. Guildhalls are the ultimate expression of a guild's power! 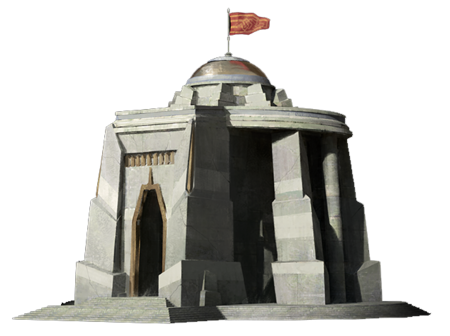 In Ashes these structures will serve as focal points for a guild, offering any guilds who construct them a whole host of benefits as well as customization options. Guild halls unlock actions a guild can perform within a node. Allow guilds to participate in the shareholder system. 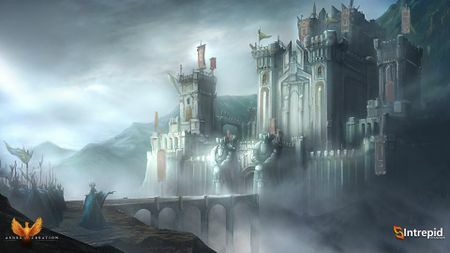 With five Castles in the world, and each having been owned by different civilizations from the far-flung past of Verra, you can expect that each Castle has its own character. Different terrains and different layouts will result in each Castle having its own advantages and disadvantages. Just because you have managed to take one Castle will not mean that your strategies will pan out in the next. Commanders will have to take into consideration the lay of the land, time of day, weather, and even seasons into account when forming their battle plans. 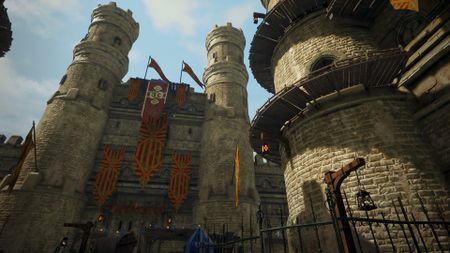 These Castles are occupied when players arrive on Verra, and their current inhabitants will have to be removed before any player can claim them. 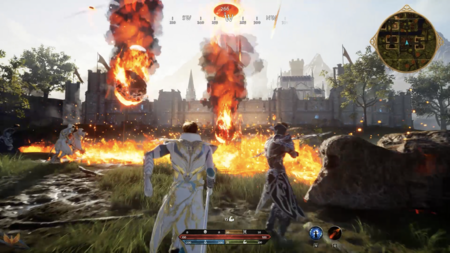 Castles will be dangerous and high-level raid zones until they can be cleared, and the first group of players to do so will gain the Castle as their reward. 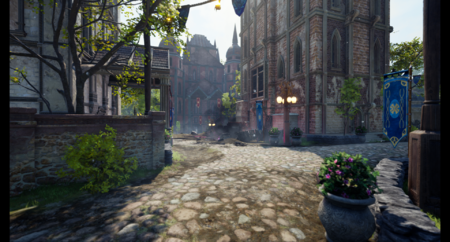 Five guild castles exist in Ashes of Creation. Castles will initially be occupied by an NPC adversary. These are the primary antagonists in the storyline. Guilds have a period of time to level up in order to siege these castles. These castles will be very difficult to take from the NPCs. Castle nodes around NPC run castles will not be present. Levying taxes for the purposes of defense (additional to taxes already imposed by node governments). Activating events and abilities that progress node citizens. Unlocking additional types of buildings in nodes. Most benefits and features of a guild castle will be housed solely to the members of the guild that controls it. 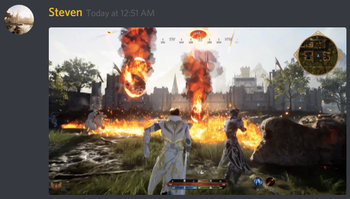 Guild fortresses are siegable guild halls within Ashes of Creation. These are different from nodes and castles. The user interface will allow emblems, logos and symbols to be designed in-game. No image import functionality is planned. Emblem editor functionality is tentatively planned for Alpha-2. 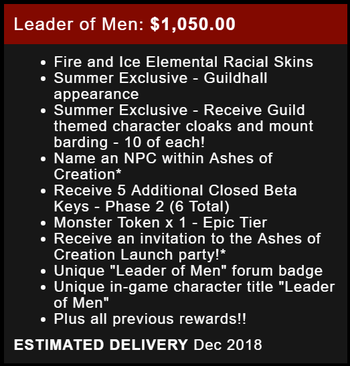 Guild themed character cloaks were cosmetic rewards for backing at the Leader of Men level or higher in the Kickstarter and Summer crowdfunding campaigns. Kickstarter/Summer crowdfunding guild rewards are assigned to a guild by the owner of the reward. Once assigned, the reward becomes an asset of that guild. Guild members that leave the guild no longer have access to the unique items of that guild. ↑ 1.00 1.01 1.02 1.03 1.04 1.05 1.06 1.07 1.08 1.09 1.10 1.11 1.12 Livestream, 27 September 2018 (55:39). ↑ 2.0 2.1 2.2 Livestream, 19 May 2017 (22:10). ↑ 4.00 4.01 4.02 4.03 4.04 4.05 4.06 4.07 4.08 4.09 4.10 Livestream, 5 May 2017 (23:26). ↑ 5.0 5.1 5.2 5.3 5.4 Interview, 8 August 2018 (9:36). ↑ 7.0 7.1 7.2 Interview, 8 August 2018 (11:52). ↑ 8.0 8.1 8.2 8.3 8.4 Interview, 8 August 2018 (15:07). ↑ Livestream, 17 November 2017 (40:56). ↑ Podcast, 5 May 2017 (47:20). ↑ Livestream, 17 May 2017 (58:18). ↑ Livestream, 26 May 2017 (47:35). ↑ 13.0 13.1 13.2 13.3 13.4 Livestream, 27 September 2018 (58:17). ↑ 14.0 14.1 14.2 Interview, 8 August 2018 (16:12). ↑ 15.0 15.1 15.2 15.3 15.4 Interview, 8 August 2018 (17:13). ↑ 16.0 16.1 16.2 16.3 Livestream, 11 January 2019 (1:04:32). ↑ 18.0 18.1 18.2 18.3 18.4 Podcast, 11 May 2018 (21:07). ↑ 19.0 19.1 19.2 19.3 19.4 19.5 19.6 19.7 19.8 Interview, 11 May 2018 (58:07). ↑ 20.0 20.1 20.2 20.3 20.4 20.5 20.6 Livestream, 5 May 2017 (31:08). ↑ 21.0 21.1 21.2 21.3 21.4 Livestream, 22 May 2017 (51:00). ↑ Livestream, 28 July 2017 (18:07). ↑ Livestream, 22 May 2017 (56:48). ↑ Livestream, 19 May 2017 (51:20). ↑ 27.0 27.1 27.2 27.3 Blog: 10 facts about castle sieges in the MMORPG. ↑ 29.0 29.1 29.2 29.3 29.4 Podcast, 23 April 2018 (21:55). ↑ Podcast, 5 May 2017 (52:32). ↑ Livestream, 17 November 2017 (49:30). ↑ Interview, 11 May 2018 (47:27). ↑ Podcast, 23 April 2018 (15:14). ↑ 40.0 40.1 Livestream, 17 August 2018 (30:29). ↑ 41.0 41.1 Livestream, 1 September 2018 (54:06). ↑ 42.0 42.1 Castle Siege Overview. ↑ 47.0 47.1 47.2 47.3 Podcast, 4 August 2018 (1:54:15). ↑ 48.0 48.1 48.2 Livestream, 22 May 2017 (52:01). ↑ 49.0 49.1 49.2 Livestream, 15 May 2017 (17:20). ↑ 53.0 53.1 Livestream, 22 May 2017 (57:37). ↑ 54.0 54.1 Interview, 11 May 2018 (44:20). ↑ Livestream, 19 May 2017 (19:23). ↑ 56.0 56.1 56.2 56.3 56.4 56.5 Livestream, 17 May 2017 (55:40). ↑ 58.0 58.1 Livestream, 31 October 2018 (47:44). ↑ 59.0 59.1 59.2 Interview, 20 October 2018 (3:35:54). ↑ 62.0 62.1 Livestream, 17 May 2017 (11:27). ↑ 64.0 64.1 Interview, 20 October 2018 (5:51).